Born into a showbiz family (his father was a film distributor, his mother was a dancer), Milner went into acting, working in plays as a child. His parents moved the family to Los Angeles when Milner was 14 to get him acting lessons and an agent. He quickly was cast in films, making his debut in 1947’s Life with Father (as one of William Powell’s sons). He was active as an actor, appearing in Sands of Iwo Jima (1949, with John Wayne), Halls of Montezuma (1950, where he met and befriended fellow actor Jack Webb), Operation Pacific (1951, again with Wayne), Mister Roberts (1955, with Henry Fonda, Jimmy Cagney, and Jack Lemmon), Compulsion (1959, with Orson Welles), and many others. At the same time, Milner was also taking roles on TV and radio shows, including acting occasionally as Jack Webb’s partner “Officer Bill Lockwood” on Dragnet, at that time a radio show, and a recurring role in The Life of Riley. His big break came when he won the starring role in Route 66 (1960-1964), which featured him driving a car around the country with a friend, taking odd jobs and helping people solve problems. Kent McCord (“Reed”), Ed Davis (the real police chief at the time), and Milner during a break from filming. 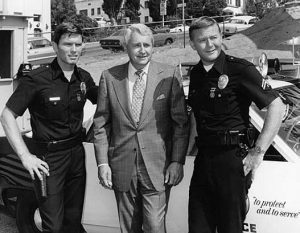 Driving around with a partner and helping solve problems seemed to come pretty easy for Milner: in 1968, Jack Webb tapped him to star in a new TV series, Adam-12, about a veteran Los Angeles Police Department officer (Milner) who takes on the field training of a new rookie (Kent McCord). The show was a hit. “Milner’s depiction of a professional and tough yet compassionate cop led to thousands of men and women applying to become LAPD officers,” says current LAPD Chief Charlie Beck — “including me.” (And including me: I first became a police cadet, then a sheriff’s deputy, in large part due to the show — before I switched to emergency medical services, influenced by Jack Webb’s last show, 1972’s Emergency!) As Webb’s Dragnet showed how detectives should operate professionally, Adam-12 did the same for patrol officers: solve problems for the citizens that pay them. The shows dramatically impacted the quality of policing in the United States, and around the world. After Adam-12 ended in 1975, Milner was mostly a guest star on other shows, most notably as MacGyver’s father in MacGyver (1985-1992). After retiring from acting in 1997, Milner returned to radio — hosting a show about fishing. Through it all, Milner had one wife: Judy, who he was married to from 1957 until the day he died — at his home, on September 6, at 83.